Outline of Prophecy 10 - Coming US Captivity - Why? NAZIS PLOTTING WORLD WAR III! Could you open your Bible and show a questioner where it tells you when you receive salvation? Do you actually get it now, when you die, when Christ returns — or at some other time? This booklet will show you plainly. Are you, at conversion, an inheritor, an heir to inherit, or what — and just what does one inherit? Now we need to learn the Bible definition of sin, and to see what the Bible reveals the spiritual consequences to be. Whatever the consequences, Webster says salvation is to save you from it — and in this the Bible shows Webster was right. Also salvation means preservation — and in this, we shall see the Bible affirms the definition. But why have you hard and possibly believed-just the opposite? Look at that — read it in your own Bible! Notice! The wages you are going to be paid for having sinned is death! Then why do so many religious people teach exactly the opposite of the Bible — why do they teach that the wages of sin is eternal life in hell? Further, let's get this point straight and plain right here- -eternal life is not something you can earn, it is God's gift through Christ! That is the plain teaching of your Bible! You earn wages. The only wages you can earn is death. Your Bible says that. We say that. But our accusers actually teach the very thing they accuse us of teaching! — they teach that eternal life is the wages you earn by your works — even though it is eternal life in hell fire! Again — your Bible says very plainly that "the gift of God is eternal life." Now this very verse (and all others in the Bible bearing on the subject agree) says plainly that what you receive by God's grace — as His gift, is eternal life. It says that eternal life is something you have to obtain as a gift from GOD! Therefore salvation actually is "eternal life" — a gift! But do you know the accusers who try to discredit this very work of God deny that? They actually deny that eternal life comes only as God's gift by grace and through Christ. They say you already have eternal life. They say you are an "immortal soul"! This is important! This is the crux of the whole question — of life — of the reason for existence! If you have an immortal soul — if you already have eternal life — then the Bible is not true when it says plainly eternal life is a gift from God. According to the Bible, what the "saved" receive as God's gift through Jesus Christ is eternal life. Salvation, then, actually is the receiving of something you don't now have — eternal life. And if that Bible statement is true, then our accusers are false! They try to deceive people into believing they do not need to be saved from death by Christ's free grace — by His shed blood. They say you do not need saving from death at all. They say, as Satan deceived mother Eve, that you will not surely die — you are — or have — an immortal soul! But the deceiver may say: "That's in the Old Testament." Read in the NEW Testament that ALL Scripture all that Timothy had known from youth, which was the Old Testament — is given by inspiration of God (II Timothy 3:15-16). What your own works have done for you is earn for you the penalty of death. And it is eternal death — eternal punishment! You see, everyone has "works" — either good or bad. He called to a second of the young men — then a third, and a fourth. Finally, with a large crowd gathering, they called the evangelist himself. But even he could not — or would not — turn to the Bible answer! One by one, they all slunk away! Of course! False accusers to the contrary notwithstanding, that is precisely what we teach. Keeping the Law will not justify anyone. We have all sinned. We cannot justify this guilt we have incurred — we cannot avoid the wages we have earned — death — by obedience, goodness, works, or anything we can do. There can never be a law, unless there is a penalty for its violation. And, where "no law is, there is no transgression" (Rom. 4:15) and could be no penalty — no punishment. If the wages- -the punishment — of sin is death, and death is the penalty, then there is a law. And if there is no law being broken, there is no transgression and no penalty — and then we need no Saviour — no salvation from the punishment. Now where did the Law come from? Again, through James, God says "There is one lawgiver" (James 4:12). That is God. God set in motion many laws — of physics and chemistry among them. The great Law of LOVE IS a spiritual Law. It is the way of peace, of happiness — of right relationship with God and with human neighbor. It is inexorably living Law as much fixed and in motion as laws of gravity and inertia. To break it is to turn in the opposite direction from peace, happiness, security, abundance, and toward strife, fear, worry, unhappiness, suffering, death. The final wages you earn travelling that way is death! So now, where are we? Eternal life can be had only from God. So, as stated above, you seek God. But you find a tremendous, impenetrable barrier — your sins you have committed. Until they are justified you have no access to God. Isaiah 55:6-8, already quoted, says that if you would seek God the sinner must forsake his way, and turn to God's way. God's Law is God's way — and sin, the transgression of His Law — rebellion and disobedience — is your way. So now you forsake your way — you forsake sin or breaking His Law. You forsake breaking it by keeping it — obeying it. At least you try — you do it the very best you can. Actually, as we shall see in a moment, you can't keep a spiritual law with a carnal mind. But, even if you could, your obedience now is only what is required of you now! It does not make up for PAST law-breaking. That penalty still hangs over you. As we have seen, by being law-abiding now, no flesh shall be justified of past law-breaking! A man convicted of committing murder last month does not erase his sentence by being law- abiding this month. That is what your Bible teaches! And that is what The PLAIN TRUTH teaches! That is what Herbert W. Armstrong and The WORLD TOMORROW television and radio programs proclaim to the whole world! Get that straight! All the good works in the world — all the law-keeping — cannot justify you of your past guilt. Now where do you find yourself? You are now submissive — obedient to God's Law. Is this necessary? Most assuredly it is! Does it JUSTIFY you? A thousand times no! NO!! NO!!! Where are you now? You have forsaken your way — sin; you have turned to God's way — His Law. And you are still cut off from God! Your works your Law- keeping, while certainly required, still has not justified past guilt — has not reconciled you to GOD. YOU still have no access whatever to God. After all this — after forsaking sin — turning to God's way, as He commands — keeping His Law — that DEATH penalty for past sins still hangs over you — the punishment is still death — and it is ETERNAL punishment death for all ETERNITY! So your Bible teaches! Don't let anyone tell you we do not teach eternal punishment. The Bible teaches eternal punishment. We teach eternal punishment. That punishment, your Bible says, is not eternal LIFE in a hell fire of endless torture — not eternal punishING — but eternal punishMENT — it is death for eternity — and God's gift is life for eternity! I want to make it plain. Don't ever be confused about what we proclaim to the whole world. The Bible is the truth, and we make it plain — mighty plain! The Bible says the punishment is the second death for eternity. It is appointed to men once to die — but after that, the judgment (Heb. 9:27). How? As in Adam all die (sinners and saints alike), so in Christ shall all be made alive — the same all, sinners and saints bathe die the first death (I Cor. 15:22-23). How? By a resurrection (John 5:28-29) — there is to be a resurrection of the just and the unjust — they that have done good, and they that have done evil. Read it and believe what your Bible says! The unjust end up in a hell fire that shall burn them up (II Pet. 3:10; Rev. 20:14-15; Mal. 4:1, 3), until they become ashes under the feet of the saved! Read it. Believe what you read in your Bible! So, where are you? Even with your Commandment keeping which — make no mistake God requires of you — still you are pretty helpless. You can't give yourself eternal life. You are doomed to die — and you are still cut off by sins of the past from GOD, who, only, has eternal life to give. The life He gave was that of the MAKER of us all! God created all things by Jesus Christ (Eph. 3:9). All things- including all humans made by Him (John 1:1-3). Therefore the life He gave on the cross was greater than the sum-total of all other human lives! That is the life that died for you — that paid your penalty for you! NOTICE! "Being now justified." How? By your works — by your required obedience to God's Law? No! By the blood of CHRIST! If you have repented, and accepted Jesus Christ as personal Saviour you are already now justified! In other words — the barrier between you and God has now been removed! You are now, by Christ's sacrifice, given contact with GOD — reconciled to Him! Notice it! You are already justified. Not by works, but by Christ's blood! The past is squared up — the penalty paid — the contact with God made. But are you already saved? "For if, when we were enemies, we were reconciled to God by the death of His Son ...." Here, again, we were reconciled — past tense. Not by your works — by Christ's death. When you have truly repented, forsaken your way, sought God, accepted Christ as Saviour and His death as payment for your past sins, you have been, already, reconciled. So the wording here is we were reconciled — past tense — to God by the death of His Son. What was accomplished by Jesus' death? It paid the penalty — it wiped out your guilty past — justified you of your guilt — reconciled you to GOD. But did it save you? Did it? Wait — don't just glibly say yes — see with your own eyes what your Bible says! Now how shall we — in future — be saved? By Christ's death? No! Notice! Read it! "We shall be saved by His life!" You were under the law, when the law stood over you, claiming its penalty. When Christ paid the penalty, and satisfied the claims of the law, you were no longer under the law, but under grace. Now does that mean you are not under obligation to obey the law — that you have license to sin — to break the law? Remember sin is the transgression of the law. There it is! We must not return to rebellion against God's inexorable Law of LOVE — His right way of life. If we do, we are again under the Law — again automatically sentenced to death! Jesus Christ did not die to give you license to continue in law- breaking. When you accept, by His grace, remission of sins, it is only for sins that are past! You cannot obtain in advance remission of all the lawlessness you might like to commit in the future. We are justified only of sins that are past. We have remission only of sins that are past — not license to break the Law in the future. Why do some religious people today teach that it is all right for Christians to go right on breaking the Law? Why do they say that grace means license to disobey God's Law? No wonder God found it necessary, through Jude, to warn us to contend earnestly for the faith once delivered to the saints by Jesus Christ — for, as you'll read in Jude 3-4, there are certain men crept in unawares — deceiving people — turning grace into license! They are the ones who accuse us of teaching "salvation by works." Would a governor pardon a man convicted of murder so he could continue murdering more and more people? God's merciful pardon — His grace — is bestowed on us because we have repented, with a sincere desire to turn from our wicked ways of lawlessness. If we are willing to live, from here on, righteously, happily as we should have from the beginning, the merciful and loving God has been willing to give His Son Jesus Christ, who, in turn, was willing to give His life, to square up our past law-breaking — to wipe the slate clean, and give us, by His merciful grace, a fresh, clean start. Many religious people — many ordained ministers — will tell you, "It is impossible to keep the Law." Are they telling the truth? What does your Bible say? Why, if it is impossible, did Christ command that if we would enter into life, "keep the commandments"? (Matt. 19:17.) Of those who claim to "know the Lord," often using such sentimental religious phrases as "Oh, how good it is to know the Lord," but who teach we should not keep the Commandments, your Bible says this: "He that saith, 'I know Him,' and keepeth not His commandments, is a liar, and the truth is not in him" (I John 2:4). At the same time, we shall explain how you receive Eternal life — that is, how you receive salvation! Back again, now, to you! You have now gained contact with God. You are mortal, possessing only a temporary chemical existence. God only has eternal life. Life can come only from life — not from death. Christ's death paid the penalty of your guilty past — it reconciled you to GOD — gave you access direct to God. But it did not give you eternal life — did not, yet, save you! Now what? Jesus Christ said it was necessary for us mortal humans that He go to the Father's throne in heaven (John 16:7) in order to send the Holy Spirit of God for us. This required the resurrected living Christ. So after His resurrection, Jesus ascended to the throne of God that rules the entire universe (Rev. 3:21). Then, some ten days later, on the annual day of Pentecost the Holy Spirit came to enter into the very minds of all who had sincerely repented of their rebellion against God and His way, and who had been reconciled to God — had gained access — by faith in Christ's shed blood for the remission of past sins (Acts 2:14). God does not "kid Himself." Some religious teachers tell you Christ lived a righteous life FOR you over 1940 years ago, and since you "can't keep the Law," as they claim, God "imputes" Christ's righteousness of 19 centuries ago to you — by sort of "kidding Himself" that you are righteous, while you are given license to still be a spiritual criminal breaking His Law! GOD does not impute to you something you do not have. If you are one who really wants to receive salvation — to repent and obey God — then here is GOOD NEWS! The Worldwide Church of God has dedicated, consecrated, converted, fully instructed and trained, ORDAINED MINISTERS in all parts of the United States and many other parts of the world — available to call on you, visit in your home, answer your questions, and explain the Bible to you. Of course, none of them will ever call on you, unless you of your own free will request it. But if you of your own volition want to know more about the Bible, salvation, and the Christian life — why not request a personal visit.. We will have one of God's own ministers call on you. This booklet has covered the truth of how we may become a begotten son of God. 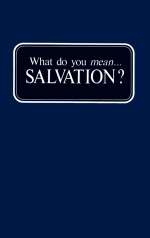 The Worldwide Church of God has published a sequel booklet making plain what salvation is — when we receive it — what one inherits — when and how one is "born again." It is titled "What Do You Mean — Born Again?" Send in your request for it now. It's free, of course.